The best way to make an appointment is by telephone, especially if you want to be seen quickly. You are welcome to contact me by email if you have any questions, but trying to find a convenient appointment time can often turn into a game of email table-tennis, and on busy days I may not be able to check my messages until the end of the day. Contact via facebook has similar problems. Picking up the phone and speaking to a human really is quicker and more convenient for you! 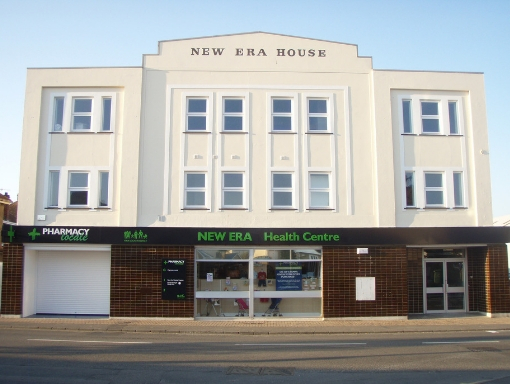 The New Era Health Centre is located in Georgetown, next to the Iceland supermarket. There is a pharmacy on the ground floor, I am up on the first floor along with Family Nursing and the doctors (The Co-op Medical Practice). Access: There are stairs at the back of the pharmacy, or if you prefer to use a lift you can enter via the doors on the right of the building. Parking: Please park in the Iceland car park. If this is busy, there is another car park 150m away, outside “Partners” at the St Clements Golf & Tennis Centre. New Era? That’s the vet’s isn’t it? The New Era Veterinary Surgery is the new building on the other side of the car park. The actual New Era House was built in 1936 by a company called the Jersey Sports Stadium Ltd. The blueprints show it housed a roller-skating rink, squash courts and a cafe. Over the years its uses changed from sports to entertainment, and the “Rainbow Room” on the top floor was a popular venue for ballroom dancing. The New Era Cinema was opened in 1954, some of my patients fondly remember the cinema because it was the only one on the island that allowed you to take a pint of beer into the auditorium. One patient recalls a particularly scary moment at the end of Carrie (1976), which caused everyone in there to jump and spill their drinks! Other patients have said “The last time I was in here was to get a mortgage”, as they remember the Barclays Bank that took up the ground floor for 42 years. In 2011 the building was refurbished as a medical centre and now houses a Pharmacy Locale, the Co-op Medical Practice, Family Nursing and the New Era Dentists as well as my osteopathic clinic. If you have any recollections of playing sport, dancing, or drinking in the New Era I would love to hear them!